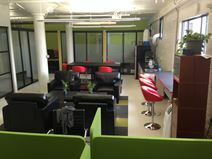 Due to its waterfront location this Charleston location in northern Boston this tech-powered business center is set amongst beautiful scenery while a complimentary shuttle service to Sullivan Square MTBA Station I also provided for quick access into central Boston and beyond. The locality also features excellent transport links which operate both frequently and conveniently throughout the region and its surrounding areas. This center is located on the waterfront, close to many excellent amenities. These former industrial buildings have been adapted to provide quality executive office accommodation on flexible terms to suit your business needs.